If you’ve been a Stryper fan for the past few decades, then you remember when we rarely heard about our favorite yellow and black clad rockers. No albums, no concerts, no updates directly from band members or video chats… it was truly the dark ages for Stryper fans. But the past few years have certainly been a different story! From new album releases to historic tours, Stryper has been extremely active and fans are loving it. The next chapter started recently with the news of Stryper’s new bass player Perry Richardson. Many know Perry as a founding member of Firehouse. Others might know him from his work with country artists Craig Morgan or Trace Adkins. But all will soon know him as ¼ of Stryper. PR: What’s up brother? How’s it going up in Green Bay? STRYPER.COM: It’s cold! (laughs) Last time we met it was when you were in Firehouse and you were doing radio promotion for Firehouse 3. You and Bill were in Green Bay on a cold night and you were lost! I don’t know if you can tell in the photo, but we were cold! (laughs) Are you in the studio with the guys right now? PR: No, I’m in Nashville. I’m finishing up my stint with this country guy first. Still banging it out on the road. STRYPER.COM: How did you first get started in music? PR: I must have been about 8 or 9 years old. I started singing in a gospel quartet in South Carolina, and I did that until I was 14. My dad was in a country and bluegrass band. He played bass and acoustic and he shared with me what he knew, and I took it from there. That’s where it all started. STRYPER.COM: What was the very first record that you purchased? PR: The first record I bought with my own money was Cosmo's Factory by Creedence Clearwater Revival. STRYPER.COM: Nice! Was that vinyl or cassette? STRYPER.COM: What about the first concert that you attended? PR: That would have been Wet Willy! You ever hear of them? PR: (laughs) They were a southern bluesy band. They were pretty big in the south. They had a couple of hits. "Keep On Smilin" was one of them. STRYPER.COM: I’ll have to look them up! What do you consider your first big break? PR: I would have to say when Firehouse got signed. I had a lot of little things happen that was great before that, but that was the first big thing. Before that CJ (Snare) and I started a band right after I graduated college and hit the road. We toured for 6 or 7 years and put out a little EP and we thought we were doing something. Finally, we just got so burned out. We were playing 7 nights a week, 51 weeks a year. It was killing us. We weren’t making any money, and we eventually broke up. Then I got a call from a band called Nantucket out of Raleigh, North Carolina. 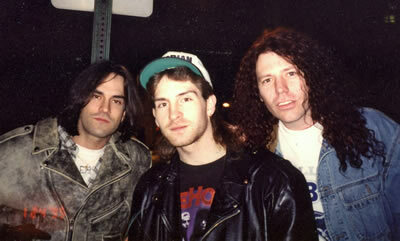 I was with them for a couple of years before we decided to form Firehouse. STRYPER.COM: This might be an internet rumor, but did you not have a name for the band when Firehouse was signed to Epic? STRYPER.COM: They had to have been kidding! PR: Man, they never said if they were kidding or not. But they said they could make candy pacifiers with the band name on it. We got kind of scared and wondered if we really wanted to sign with this label. Firehouse just kind of popped out of Michael’s mouth and we went with that! (more laughs) But they ended up being a great label for us. STRYPER.COM: Then you left Firehouse after the release of Category 5, which I personally feel was the best and most consistent Firehouse release to date. PR: Well, thank you. I ended up writing seven of the songs on that record. Sonically it might not have been as good, because we did it ourselves. We recorded that in Bill’s house. But I really like that record too. STRYPER.COM: So what were you up to after you left Firehouse? PR: As you could probably tell by listening to the Category 5 album, my musical taste was changing. I’ve always loved country music. I mean that’s what I first learned to play as a kid. I just got burned out on the stuff we were playing. At that point CJ and I had been together since 1981. We were growing apart and it wasn’t fun anymore. So I left and moved to Nashville. At the time I was really depressed and didn’t really know what to do. I wanted to put a band together, but I couldn’t find any guys I wanted to jam with. One day a buddy of mine called asking if I could help him out and run monitors for a gig because someone was sick. I'd never done monitors before but he said it was easy. I didn’t have anything to do so I tried it. This was for Craig Morgan, and their monitor guy ended up quitting. So I was doing his monitors for about 3 or 4 months. Then Craig’s bass player had to go to a wedding and they couldn’t find a replacement. Craig had no idea I had been in a band ... much less Firehouse. So I told him I played bass and we jammed. I’ve been hearing these songs for the past 4 months and I didn’t rehearse, I just followed along. But he ended up firing his bass player and hiring me! So that’s how I got in the band. PR: My plans kinda fell by the wayside of putting a band together, but I was having such a good time with these guys. I ended up playing with Craig for 11 years. Then I got a call from Trace Adkins out of the blue one day. He asked me to be in his band, and it was a whole lot more money. I hated to leave Craig, but I couldn’t turn the money down. That lasted for two years. I wasn’t really having a real good time over there. I called Craig back up and said if you ever need a bass player, I’d love to come back. He called me back a week later and took me back. And that’s pretty much what I’ve been doing for the past 15 years. STRYPER.COM: So on October 30th, a press release comes out saying that Perry Richardson is the new bass player for Stryper. How did that come about? PR: It was fate or the hand of God, man. 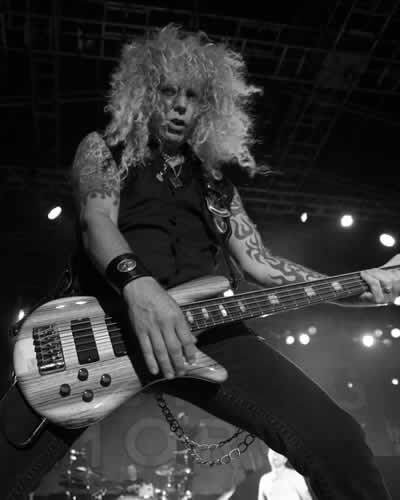 This old friend of mine ending up talking with Dave Rose (Stryper’s co-manager), and Dave said that they were looking for a bass player. My friend Marty said that he knew just the guy! And Dave was familiar with me because he used to play in a band that opened for my old band Maxx Warrior! So I meet with Dave and then after that Michael Sweet called me. Last time I saw Mike was about 5 years ago in Nashville, but we met in person maybe 3 times total. But he remembered who I was and invited me to fly over to jam and see how it felt. I had about a month to learn 5 songs. We all flew in and setup in a little room in his house. We played the songs, and it felt good. Then we sang some together, and the vocals sounded good. So they said that they would call me and let me know. A few days later I was about to start a game of golf when I got the call that I was in the band. I was so excited I couldn’t even play the game. It was the worst game of golf I've played in years! (laughs) But that’s how it happened. When I met the band, I just felt so at home with them. I couldn’t be more happy. STRYPER.COM: Are you going to continue with Craig Morgan, or will you be solely with Stryper? PR: I’m going to stay with Craig through March, and then start with Stryper in April. I’m going to move back to my hometown of Myrtle Beach and build a house down there. So I’m going to be pretty busy for the next few months. I want to get back and spend more time with my family. I’ve been on the road for the last 30 years so I didn’t get to spend much time with them. So this is perfect timing. I’ve wanted to move back for some time, so when the Stryper thing came around it was meant to be. STRYPER.COM: Have you heard any of the new material for the new album yet? PR: I have not heard anything new yet. STRYPER.COM: What songs did you learn for your first Stryper jam? PR: Um… "The Way", "Soldiers Under Command", "Rock That Makes Me Roll", "Calling On You", and "No More Hell To Pay". STRYPER.COM: I can't wait to hear your vocal harmonies in Stryper. Oz and Mike both have very distinct vocals that I think will blend nicely with yours. PR: Well thanks. I'm so looking forward to it, I can't wait to get going. I am so honored and overjoyed. I can't believe this is happening. They were one of my favorite bands. When I was in Maxx Warrior with CJ we opened for Stryper in Charlotte in 1985. That was one of the highlights of my life! And to now be playing with them is a dream come true for me. And everybody working with them, like you, has been so nice and so organized. They've really taken me in, it's such a great feeling. And THEIR new music… I tell you what, Fallen is my favorite Stryper album yet. STRYPER.COM: Do you have a favorite Stryper song? PR: Right now it’s "Heaven" off of Fallen. STRYPER.COM: The Stryper fan base is very loyal and unique, and you’re probably getting a taste of that now. PR: I am online, and I’m loving it. I love fans that are passionate about things. That’s the way I was as a kid, and I was passionate about certain things. That’s how these fans are. It’s so amazing to me. I’m so looking forward to being a part of that and meeting these people on the road. I’m looking forward to it! STRYPER.COM: What’s one thing Stryper fans would be surprised to know about you? PR: Hmm…. Well, I grew up on a tobacco farm. That was not fun! Cropping tobacco is awful. Back in those days you did it all walking by hand. I did that for years and years as a kid. But otherwise Myrtle Beach is awesome. It’s a great place to grow up. Other than that I had a pretty normal childhood. My mom taught Sunday School for as long as I can remember. Great parents. I’ve been lucky. 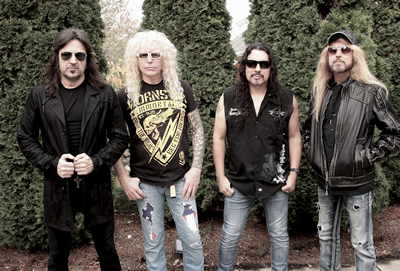 STRYPER.COM: So would you put on some Yellow & Black spandex if Mike decides to go that route for the new album? PR: I’d be right there with them wearing it! PR: Yes! (laughing) I love it! Seriously, yellow has always been my favorite color. My first new car was back in 1986 and it was this little Nissan truck. Brand new it was red, and I had it painted yellow. And I think the license plates had the numbers ‘777’ on them. STRYPER.COM: So other than living with your lovely wife Shelley, it sounds like you have some dogs as well? PR: Man, those are the neighbor's dogs! I can’t believe you can hear that. I’m sitting in my sun room, and those dogs are always barking. Another reason I want to move! (laughs) But we have an English and French bulldogs, one of each. They’re amazing, like my children. STRYPER.COM: Any final comments to the Stryper fans? PR: I just want everybody to know that I am one of the happiest guys on the planet right now to be the new bass player for Stryper. I can’t wait to get out and start playing, and meeting as many of the fans that I can. So everybody come up and say ‘Hi’ to me.